Easily hang a few bird feeders or decorations from branches using these BestNest Stainless Steel "S" Hooks. This set of 4 hooks makes displaying a few ornaments or bird feeders simple, and brings a bit more length and versatility to your hanging items. The top arch of each hook attaches to a hook or metal rod up to 1" wide, while the bottom of each is perfect for holding a feeder or other adornment. The silver color of each unit adds a bright look, and their stainless steel construction remains durable and hardy for seasons of use. 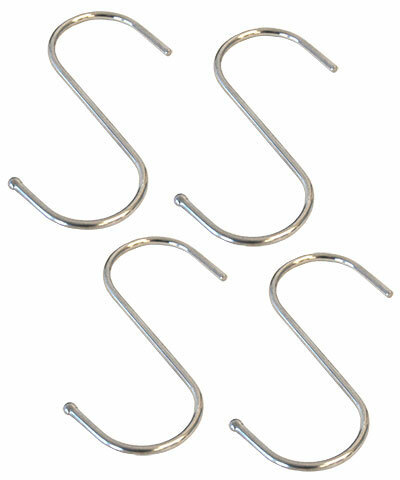 Display your hanging items easily with help from these Stainless Steel "S" Hooks. Note: This case pack includes 4 of the BestNest "S" Hooks, Stainless Steel, 3". Audubon Window Glass Hanger, Clear, 11"
Parasol "S" Hook, Black, 7"
Handy Hook Pole Extension Adapter, Yellow, 4"